Somewhere into the second hour of Seijun Suzuki’s insane kabuki-musical Princess Raccoon, a woman rises from the grave to perform a maudlin song in the middle of a waterfall. That woman is Hibari Misora - an iconic Japanese Enka singer that passed away in 1989 from pneumonia - and the song is ‘Kawa no nagare no yō ni’, her final recording and a track voted as the greatest ever Japanese song with ten million votes. Her presence is an odd one. Bought to life by shoddy CGI, she barely communicates with the other actors on screen, simply rises from the grave to remind her audience how loved she is, then disappears once again. In the mid-noughties, this was a surreal moment to witness in your local arthouse cinema. Even if you hadn’t witnessed the nonagenarian Suzuki’s 2006 film (and you should, if only because it’s batshit insane), you will have noticed that digital representations of actors have become a huge part of the cinematic landscape. Filmmakers like Steven Spielberg, Richard Linklater and James Cameron have been behind films that turn to motion-captured casts, acted by real-life actors but rendered and transformed in post-production. This is the way things are now, and the results have come along leaps and bounds. Past efforts from Suzuki or Robert Zemeckis (Beowulf) were infamous for their casts’ dead eyes and rubbery movements. Whereas, as of this moment, the number one movie in the country has an utterly credible performance by a CGI raccoon with Bradley Cooper’s voice. Before that, it was a mo-cap Andy Serkis ferociously leading his army of apes through a ravaged San Francisco. Cinema is about fascinating characters, just as much as it's about fascinating actors. When used right, the new strain of digitally-assembled casts is giving us a world of fascinating characters. With his new film The Congress, Israeli director Ari Folman offers an alternative response. 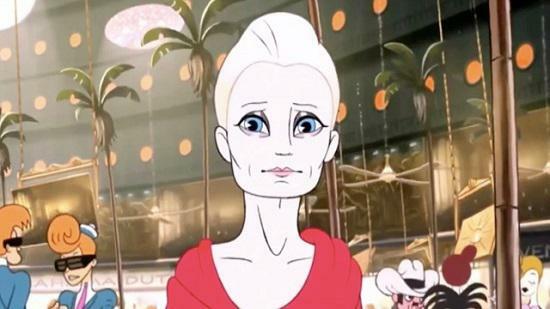 The follow-up to 2008’s BAFTA-winning Waltz With Bashir, the film follows actress Robin Wright (House of Cards, The Princess Bride) as herself, navigating a risky deal from a major Hollywood studio. The studio president (Danny Huston, adding to his gallery of creepily roguish authority figures) states that a rapidly changing cinema culture, where motion-capture scanning of actors reigns, will pump new life into Wright’s flailing career. All she has to do is accept that her numerically scanned likeness will become the studio’s property, to be applied in whatever way they see fit. Pressurised by the studio head and her agent (Harvey Keitel: yelling, possibly wearing eyeliner), she caves in, taking a note of how her digitally-assembled doppelgänger will remain forever ageless. Yet for twenty years, she cannot act in any film, nor any television show, nor appear on any stage. Folman’s two-hour film only stays rooted in the world of studios and agents for its first half, before morphing into an animated adaptation of sci-fi author Stanislaw Lem’s 1971 novel The Futurological Congress. An adolescent sci-fi buff, Folman has been trying to adapt Lem’s satire of Communist-era Poland since his time as a film student in the early Nineties. He claims the book’s depiction of a chemically-controlled dictatorship shares similarities with the film industry’s monopolization by major studios, which led to him analysing the current era of digital cinema. In press materials, he makes explicitly disparaging mentions of a “post-Avatar era” and hopes that the “human actor will win out”. It’s clear that Folman shares a vague-yet-intense fear of an increasingly digital age with his idol. According to him, this technological influx surely marks the end of days - an increasingly dated point of view for any director to portray. Folman is adding the slightest of tweaks to an adaptation of a Communist-era sci-fi novel he first read as a sixteen year old and calling it a day. That’s not mindblowing, future-forward sci-fi; that’s advocating the qualities of the past. The Congress presents itself as a philosophical satire of a potential future, but it’s actually narrow-minded and often ignorant about the present. In the film’s best scene, Wright is suited up for her career-ending motion-capture session, having her physical data scanned on an alien-looking spherical stage. Sixty thousand LED lights flash on and off from all angles as Wright laughs and sobs through an overwritten Keitel monologue that acts as an elegy for all screen acting. It’s a tragic and otherworldly scene, helped along by Wright’s strong performance. However, the scene is directed at an uninformed fever pitch, working off the same superstitions that had 1896 audiences screaming in fear at approaching on-screen trains. Folman admits as much in interviews, stating that he was unaware that the Institute for Creative Technology’s Light Stage 6 existed. That’s the same spherical contraption he stages his film’s emotional high-point around, which existed before Folman’s supposed “post-Avatar era”, one whose technology he didn’t believe existed until the film was in pre-production. The fact that the director was shocked by its existence lends the nagging possibility that his fears are somewhat uninformed. Also, it seems uncertain as to whether Folman’s cast were chosen for their past in digital film’s rise. Wright was Queen of the Danes in Robert Zemeckis’ motion-captured Beowulf, then Ebenezer Scrooge’s lost love in Zemeckis’ similarly mo-cap adaptation of A Christmas Carol. Paul Giamatti is a staple of CG animation, having appeared in multiple Dreamworks films, and Huston played Poseidon in TWO Clash Of The Titans movies. If the presence of Folman’s cast is a meta-commentary on the increasing digitisation of actors, it’s a muddled one. There are a number of rabbit-holes that Folman could have easily tumbled into that actually explore the reverberations of an increasingly digitised world. Earlier this year, Spike Jonze’s Her presented a near-future where people developed emotional relationships alongside evolving artificial intelligence. Each week Catfish offers a TV series based around Internet dating, exploring young people’s desire for affection in a world where online communication allows us to present ourselves in markedly different identities. Both of these are recent titles, both are accessible, and both are even-handed regarding the topics of a digital world. They actually bother to involve themselves in the future that Folman can only sneer at as a “post-Avatar era”. There are a million other things that Folman could explore in the two-hour running time of his new film. Are the conservatively attractive and Caucasian actors that Hollywood still favours really under threat from technological advancements? Why animate your future hellscape – a world that wouldn’t function without technological advancements - in the style of a Betty Boop cartoon from the Thirties? Why is Folman’s idea of biting Hollywood satire dressing up Wright as Ke$ha? Instead of actually thinking things through, The Congress finds Folman stubbornly beholden to simplistic opinion. The Congress is plenty didactic about what an increasingly digital cinematic future means, but more than anything, it’s reductive about its possibilities.